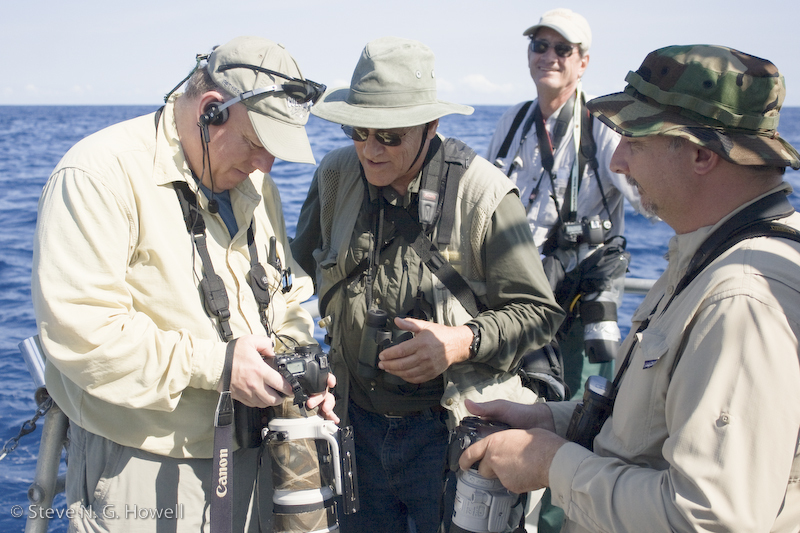 Steve is a senior international bird tour leader for WINGS and has written several books including A Guide to the Birds of Mexico and Northern Central America, Gulls of the Americas (with Jon Dunn), and the recently released Petrels, Shearwaters, and Albatrosses of North America. He lives near Point Reyes, California. If you’re a birder and you don’t own a digital camera, congratulations. But even if you haven’t become digitally entranced, some of the following may be of relevance. And the pictures might be fun. In the same way that guns themselves aren’t dangerous, so digital cameras aren’t dangerous. It’s more about how they are used. These days, seemingly everyone and their dog has a digital camera. So when somebody finds an “odd” bird, they often simply snap a few images (directly or digiscoped) and move on. Later they can post the images online, and expect somebody else to identify the bird for them, be it a weird gull in California or an Old World vagrant in Alaska. If the images aren’t sufficient, however, and there are no supporting observational field notes, then the “record” goes nowhere. That’s fine with me, but some of the “observers” involved, and some records committee members I talk with, find it annoying. Obviously, none of us knows the field marks of every vagrant, so getting some pictures seems like a good thing. And it is. But in many cases, a few minutes of careful observation could preempt the puzzle that a photo without context may become. Digital cameras may make us lazy, less patient, and less observant. And I’m not pointing fingers here, as I include myself among the victims of this trend. I won’t belabor the point with examples of a possible woodswallow in Alaska a few years ago (supposedly just a regular swallow looking funny in the photos, but who really knows), or a recent swift in Minnesota (looked to me like simply a Chimney Swift, but some good birders were waffling about White-collared and even White-naped), or a putative Common Redshank in Alaska (was it some cool hybrid, or maybe even a redshank?—we’ll never know). Oh, right, I wasn’t going to do this. So what about some pros of digital? 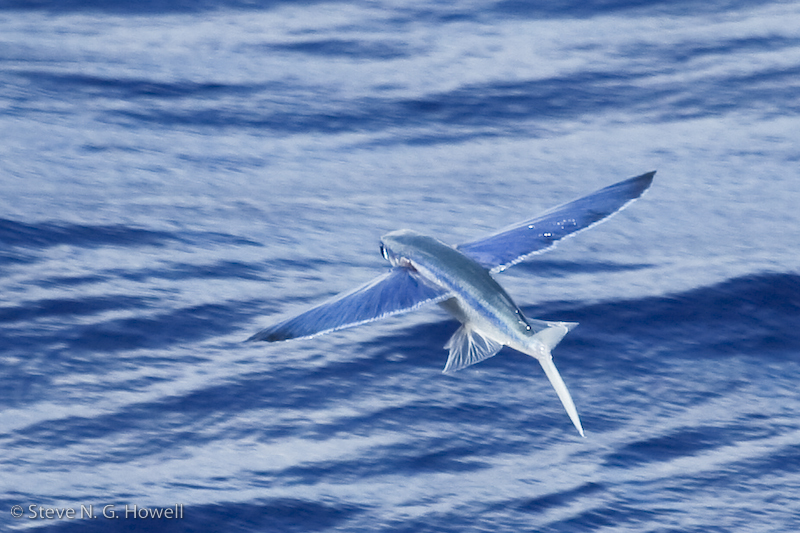 Well, courtesy of digital images, I believe that the percentage of correctly identified jaegers on pelagic trips has increased in recent years, at least retrospectively. 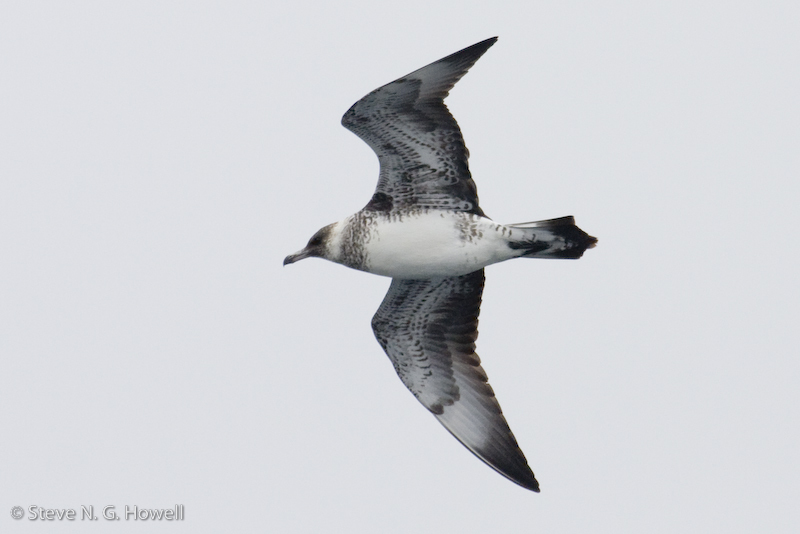 In the “good old days,” a jaeger might approach the boat on a pelagic trip to the cry of “Jaeger! Incoming at 5 o’clock,” and we’d all watch it, search for features the field guides told us about (in other words, good luck if it wasn’t a breeding adult or a classic juvenile), hope to see something to key in on, and watch it fly away. People would look at one another, some bold soul would call out a name, and if nobody disagreed then it would get logged as Species X. If you (as a participant or even another leader) didn’t think it was Species X, there wasn’t much you could do (well, you could be honest and write “jaeger sp.” in your notes). Or perhaps you could wait a week or two for some film to be developed—if anyone had taken a photo. And then you would have to go to the photographer’s house, or ask for dupes to be made and sent to you via the postal system. And so on. Fig. 1. “Chimping” to check an ID. Does this look familiar? Photo by © Steve N. G. Howell. Leaders look at each other, nod, come to an agreement, and pronounce it was Species X; and this time the ID can be supported (or contested) if desired. The three images of jaegers shown here (Figs. 2–4) involve birds that might have been contentious ID problems without digital images. They can be identified when we have something to evaluate, something that isn’t flying away. But have we actually become any better at identifying jaegers in the field, in life? I’m not so sure. So is that a pro or a con? Neutral, perhaps, with pro potential. Fig. 2. 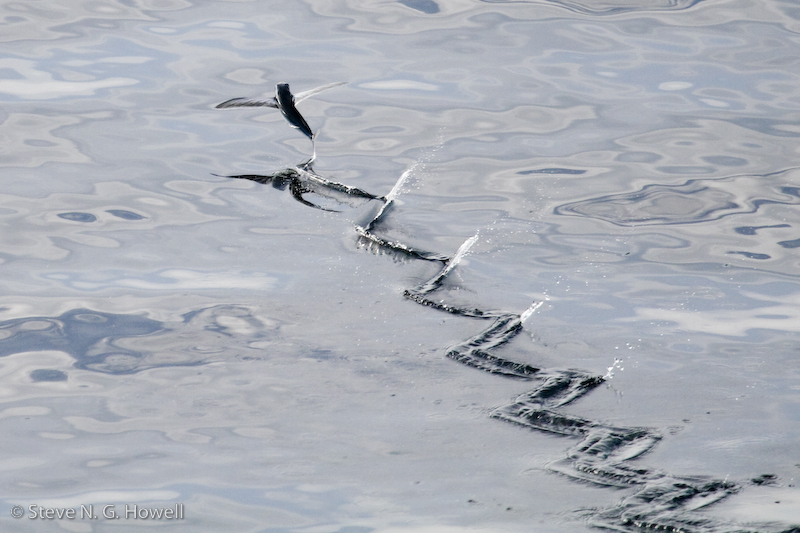 First-summer Long-tailed Jaeger; mid-August. Photo by © Steve N. G. Howell. Fig. 3. 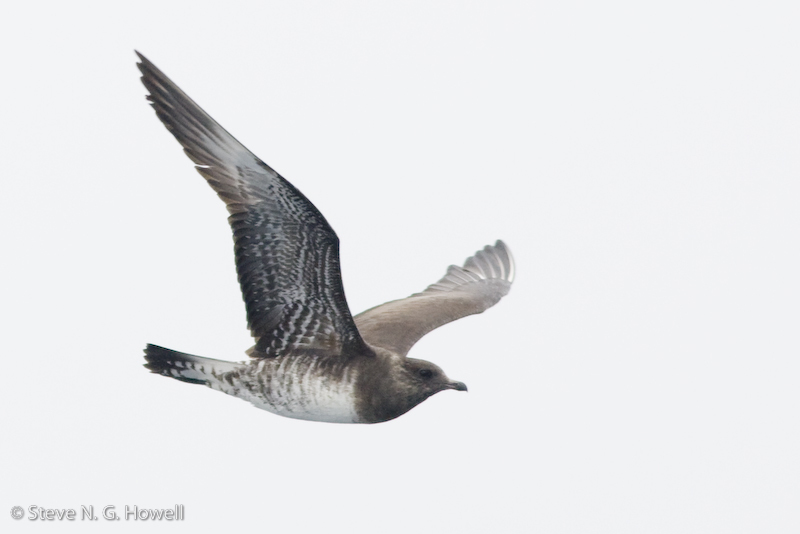 Immature Pomarine Jaeger, age uncertain; mid-August. Photo by © Steve N. G. Howell. Fig. 4. 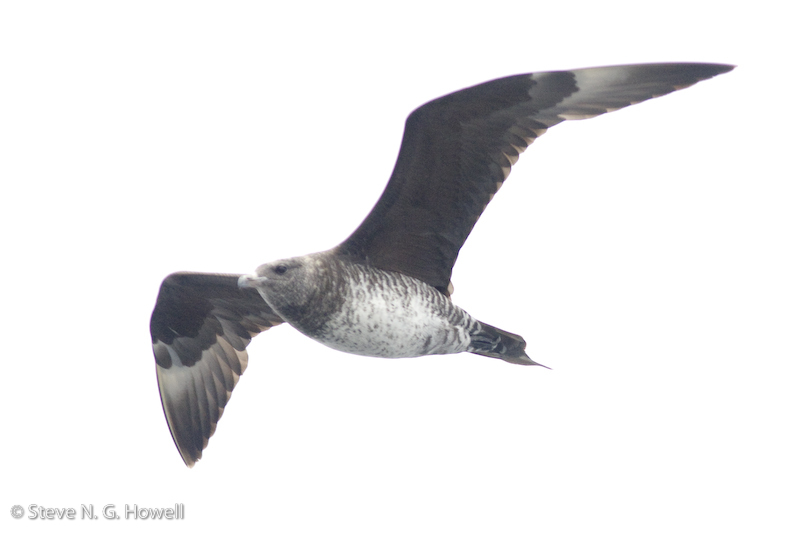 Adult Pomarine Jaeger, with old tail projections abraded to a point; mid-October. Photo by © Steve N. G. Howell. But isn’t digital photography just great in everyday birding? I mean, as well as being able to take hundreds of images in a few minutes and check them as we go for correct camera settings, we can also stop shooting when we have the image we’ve been aiming to get. How cool is that? Then we smile and move on, excited to go download the images and see them on a computer screen. But wait, what happened to watching birds? Isn’t (wasn’t?) it called bird-watching? These days, it seems more and more like bird processing. Perhaps I’m the only person out there who has been seduced by digital photography at the cost of observation—but I’m guessing not. The habit really can become addictive. Then again, I have learned a vast amount from being able to study digital images. Now I’d like time to test that knowledge, to see if it’s made me a better birder in the field. If only I could stop taking photos and find out! Will there one day be Digiholics Anonymous? “Hi, my name is Steve H., and I haven’t taken a digital photo for 3 weeks now… It’s not so difficult. I just go birding without a camera and have to simply look, to observe, to pay attention. And I’ve seen so much more. It’s wonderful. One day at a time I can do this.” Or not, as I don’t think you could get me on a boat and leave my camera on shore—just in case. 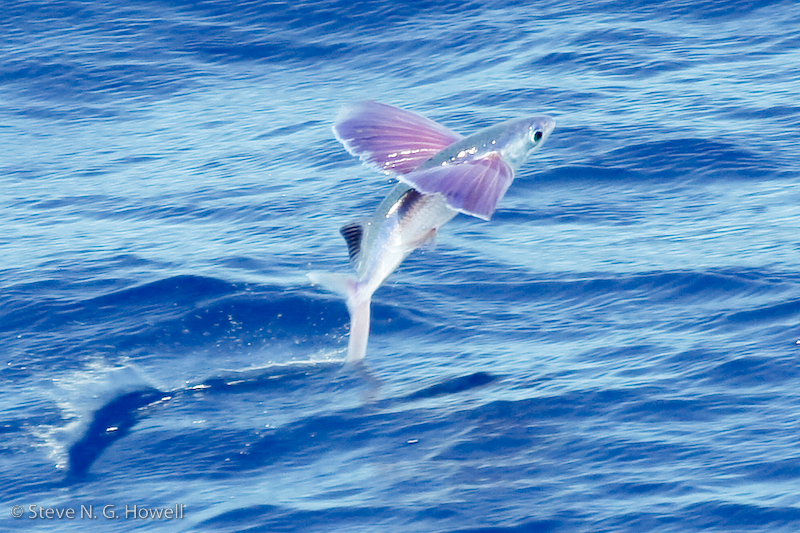 Have you ever tried taking pictures of flyingfish? That’s something where digital photography has really made a difference. Many birders on land have gone over to the “dark side”—watching insects, such as butterflies, dragonflies, and so on. 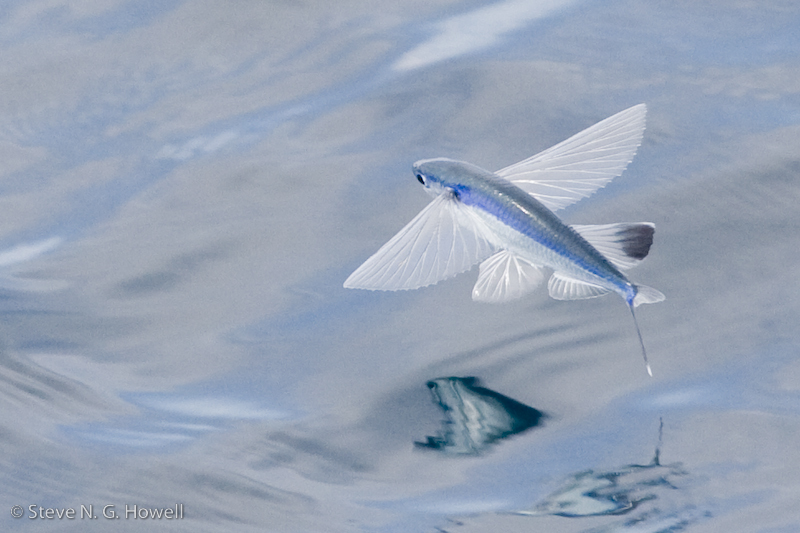 There aren’t so many pelagic insects out there, but flyingfish are a worthy pelagic counterpart to butterflies. Without digital photography, however, it would be difficult to appreciate them. Taking pictures of these subjects with film was just not feasible. At least, I didn’t have the money to spend on tens or hundreds of rolls of film to get one or two decent images. 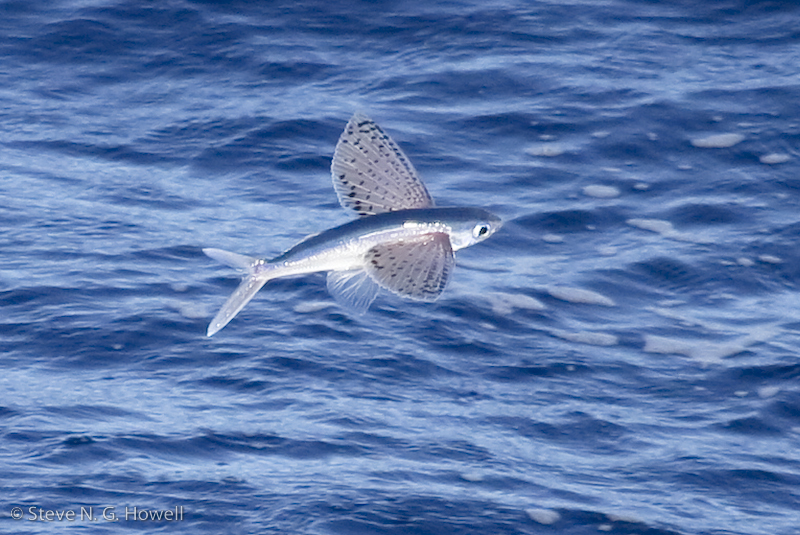 The hit rate for reasonable flyingfish images is perhaps 1 in 20. 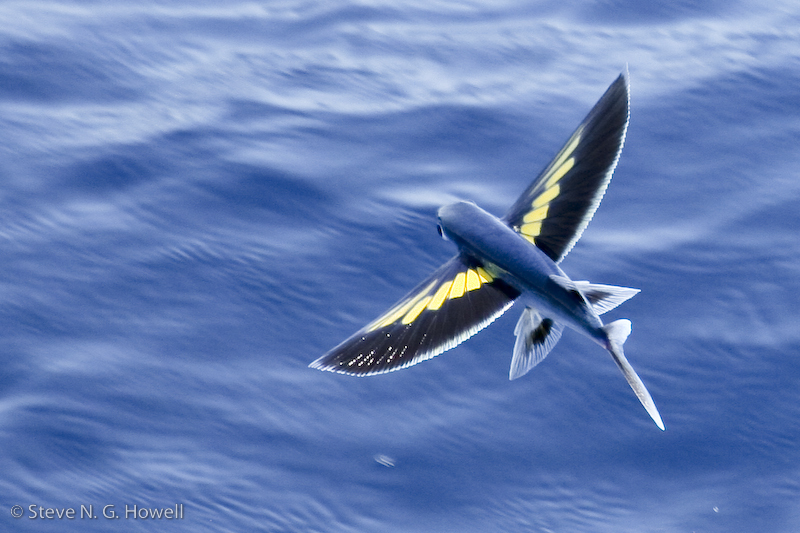 Which means my current digital photo file of 556 images of flyingfish (50+ “types”) translates to some 11,000 images taken. Let’s see, that would be more than 300 rolls of film. Younger readers: Look up “roll of film” on Wikipedia. 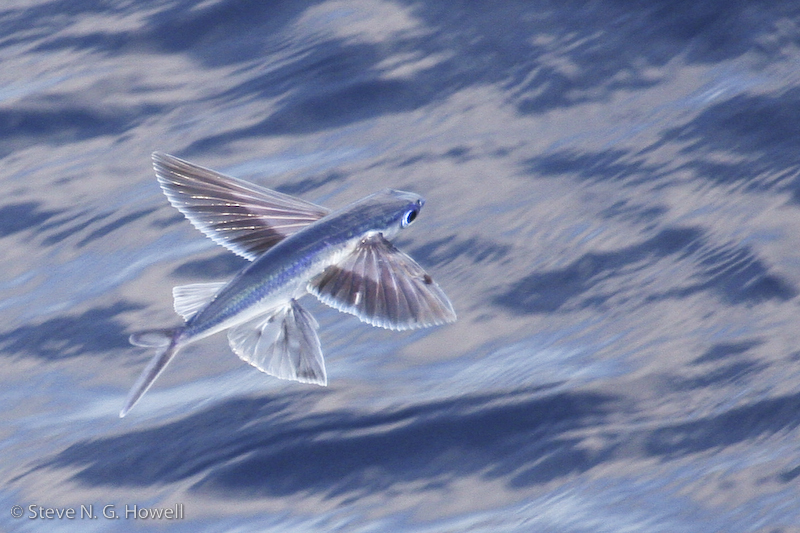 There’s no formal field guide to flyingfish—yet. 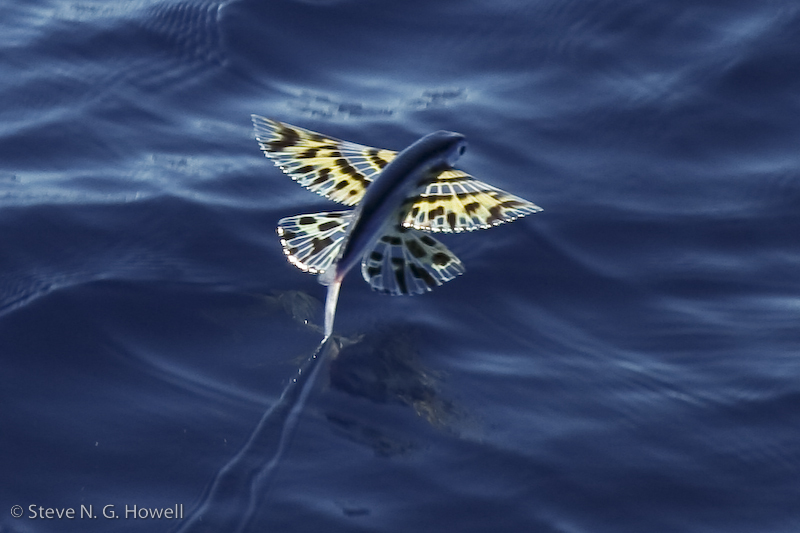 But watch this space… Below are some images of flyingfish (Figs. 5–17), mainly from the tropical western Pacific, but also a few from the Atlantic, off Cape Hatteras. Some of these animals are small, with a “wingspan” of about six inches, whereas others, like the Solomon Cerulean, with its blue-morpho–blue coloration, may have close to a three-foot “wingspan”! Fig. 5. Yellow Bandwing. Photo by © Steve N. G. Howell. Fig. 6. Thrushwing. Photo by © Steve N. G. Howell. Fig. 7. Oddspot Midget. Photo by © Steve N. G. Howell. Fig. 8. Leopardwing. Photo by © Steve N. G. Howell. Fig. 9. Fenestrated Naffwing. Photo by © Steve N. G. Howell. Fig. 10. Violaceous Rainmaker. Photo by © Steve N. G. Howell. Fig. 11. Ornate Goldwing. Photo by © Steve N. G. Howell. Fig. 12. Big Raspberry. Photo by © Steve N. G. Howell. Fig. 13. Solomon Cerulean. Photo by © Steve N. G. Howell. Fig. 14. 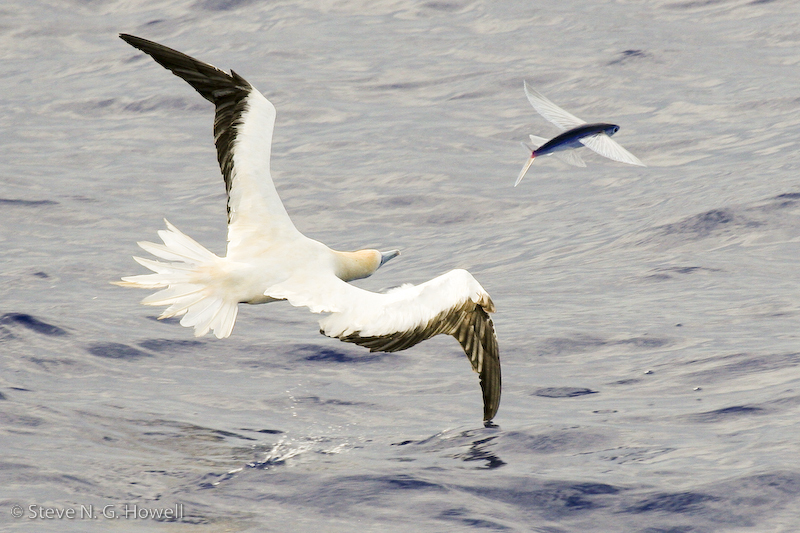 Fenestrated Naffwing chased by Red-footed Booby. Photo by © Steve N. G. Howell. Fig. 15. 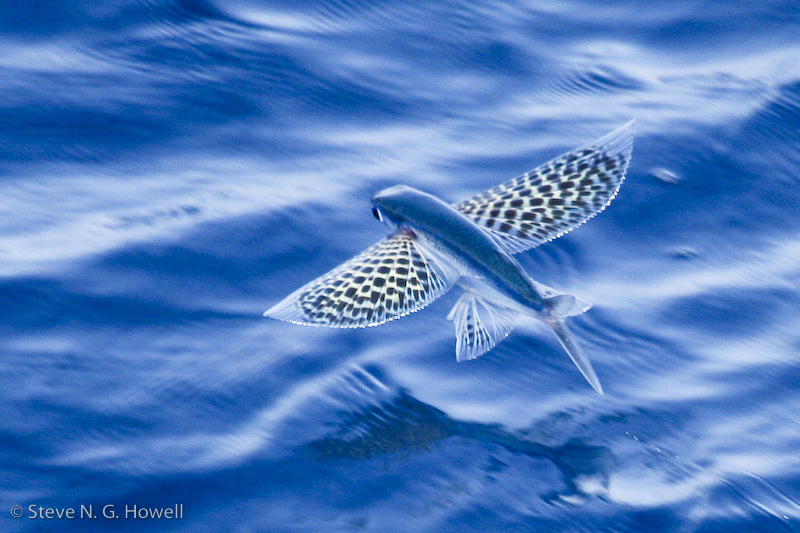 Flying squid, species unknown. Photo by © Steve N. G. Howell. Fig. 16. Atlantic Necromancer. Photo by © Steve N. G. Howell. Fig. 17. Blue Bandwing. Photo by © Steve N. G. Howell. Note: English names have been created by field observers because matching color images to descriptions of pickled specimens isn’t easy. 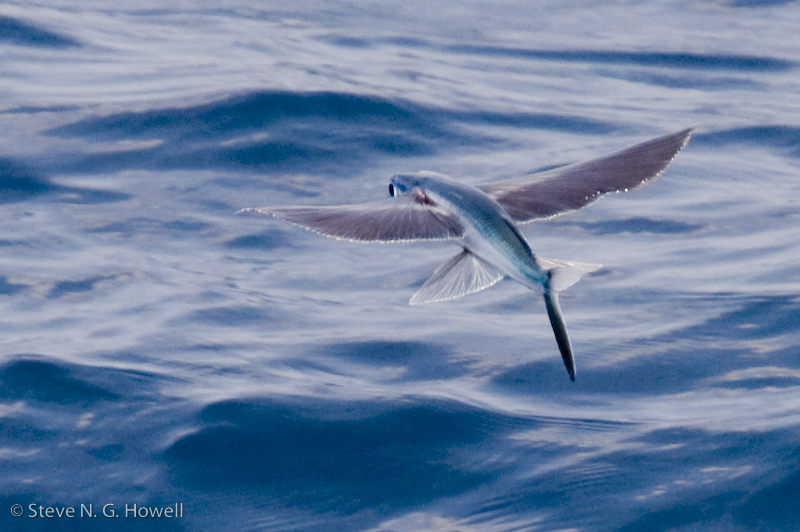 So next time you’re on a warm-water pelagic and the birding is slow, watch for flyingfish. 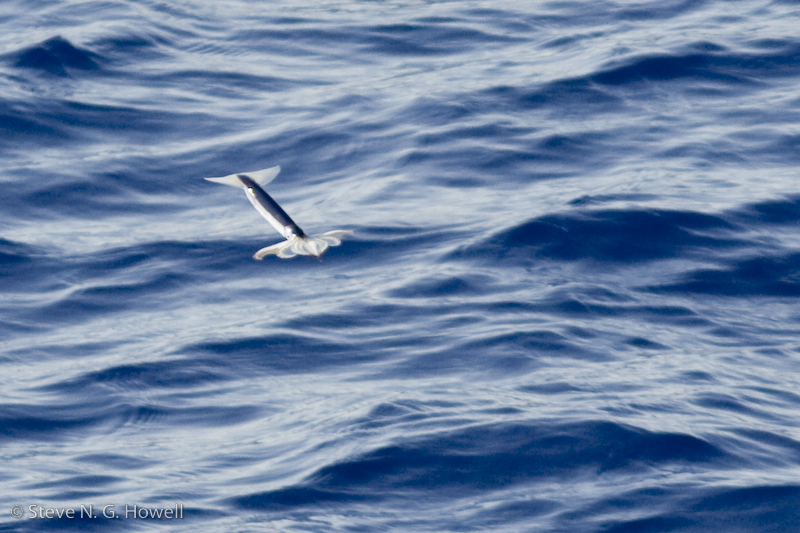 And, if you’re really lucky, flying squid… Remember, there’s more to pelagic trips than seabirds and those large, swimming and spouting things people get excited about.